Whilst festivals are not quite here yet and summer seems to be trying to arrive before swiftly changing its mind, I'm sure many of you have turned your thoughts to any upcoming holidays you might have booked. My anticipated trip to Cyprus isn't until the end of June, time is flying by so quickly that I'm sure it'll be no time until I'm packing that suitcase and donning the sunnies. I've already bought my bikinis and started on the rest of my holiday shop, but one thing which is easy to overlook is the beauty side of holiday-planning. 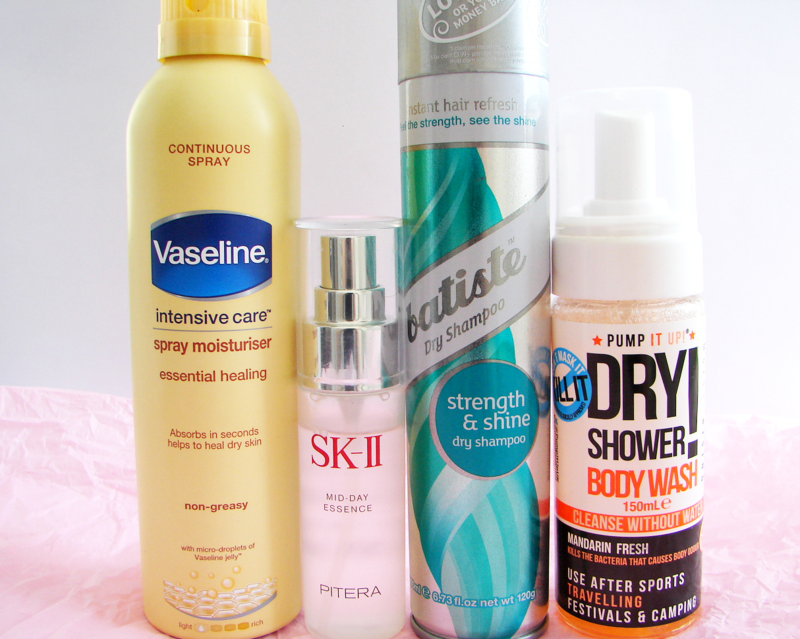 Suitable for festivals and holidays alike, these four beauty products are as convenient as they get, and are sure to be packed alongside my passport come June. Probably the holy grail of dry shampoo, this product doesn't even need introducing. Whilst I love the full-sized versions (they last ages! ), the mini travel-sized version are perfect for popping in your suitcase or even your hand luggage allowance. A few spritzes of this stuff on the root of your hair before massaging in or gently brushing away will leave your barnet feeling so much fresher, lighter and cleaner as well as injecting some much-needed volume for flat, thinner hair. These are a festival essential; days in a tent with undesirable showering facilities means that shampoo in a can will become your ultimate best friend. This stuff was even named the second best dry shampoo out there by reviews.com! Massaging in body lotions after a long bath may add to the relaxation, but on a day-to-day basis, remembering to nourish your limbs may seem like a bit of a chore. I know I'm rubbish at remembering, and now the sun is urging us to ditch the tights, I need to start taking more care to make sure my pins look healthy and glowing (albeit still pale). This spray-on Vaseline moisturiser is my absolute favourite 'fast beauty' product at the moment, and something I can see becoming a staple in my body care repertoire. It's self-explanatory, just spray all over your body and voila! Coming out in quite a fine mist, it may seem quite 'wet' at first but you'll find it soaks in so fast, allowing you to continue getting dressed just seconds later and carry on with your day; it'll fit seamlessly into your daily routine. No greasy feeling and nourished skin...the best product for lazy people like me! Although this particular face mist is a tad on the pricey side for taking to festivals and the like, this is definitely one of the best skincare spritzes I've ever used. Specifically designed to be used 'on the go' as a skincare pick-me-up, this is something which finds itself in my handbag when it starts to get a bit warmer. Not only does the spray help to cool your skin, feeling incredibly refreshing and soothing (great for holidays), but pitera and a moisture-lock complex helps to give your skin a burst of moisture and hydration. This can be sprayed on top of make-up (it doesn't smudge any eye make-up etc) and just leaves your skin feeling softer, brighter and more radiant. You know those moments in the afternoon where your skin starts looking a bit duller and the tiredness starts to kick in- this face mist helps to rectify this in an easy, convenient way. 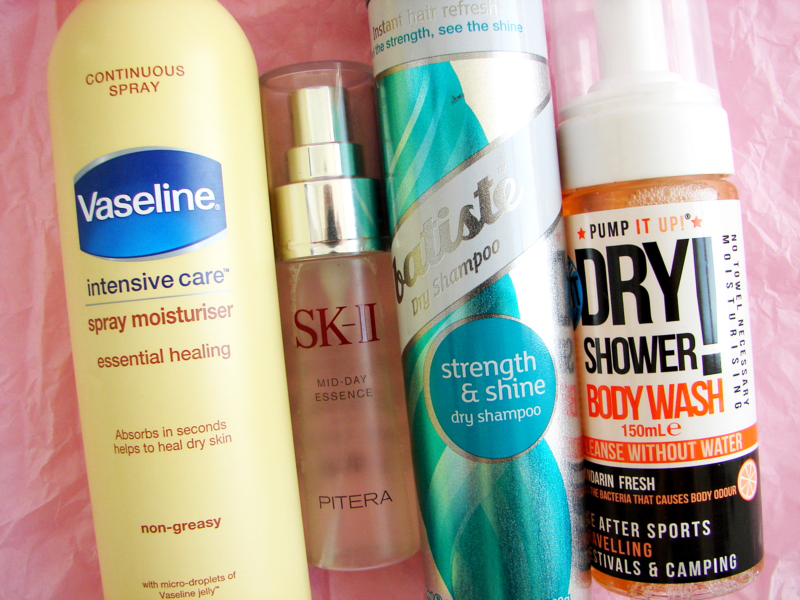 You can check out my other favourite face mists for holidays here if you're looking for something more affordable. Not so much a product for holidays, but certainly a winner for any fanatic festival-goers, this is the dry shampoo equivalent for your body. It comes in coconut, eucalyptus, cucumber, raspberry and mandarin scents; I have mandarin (an unusual scent; I would definitely opt for coconut next time!). The easy pump produces a super light foamy texture that is then applied over the body. It reminds me a lot of antibacterial gel, but a foam version; it's a very odd concept to be washing your body without actually washing it but works well enough to keep you going over a festival weekend! Certainly not a product for everyday or regular use (I mean, it's never going to replace a shower), but a really convenient product for when you're camping in a muddy field bopping along to music. What are your on-the-go essentials? Are there any convenient products I need to get ahead of holiday season? This post contains some press samples.